Oh Italy, an adventure we can never forget. Positano, where our accommodation stood, was built only to let in those of adventurous hearts. Our beautiful home for the next six nights was surrounded by a road pathed only for eager feet; so narrow, so tricky that no car could take the journey. Our home housed a beautiful garden, full of every delicious vegetable you could image, leading to all plant based and locally sourced meals created by the talented Chef named Marta. Every morning we woke up to make our way to a wooden stage overlooking the unreal, sharp blue ocean to partake in our daily yoga, lead by Morgan Haley. With every movement we inhaled the crisp, salty air and exhaled any constraint or worry allowing for each day to meet us with open arms and unity. One remarkable day we made our way to the glimmering Mediterranean Sea where two white boats decorated with wooden paneling awaited us. 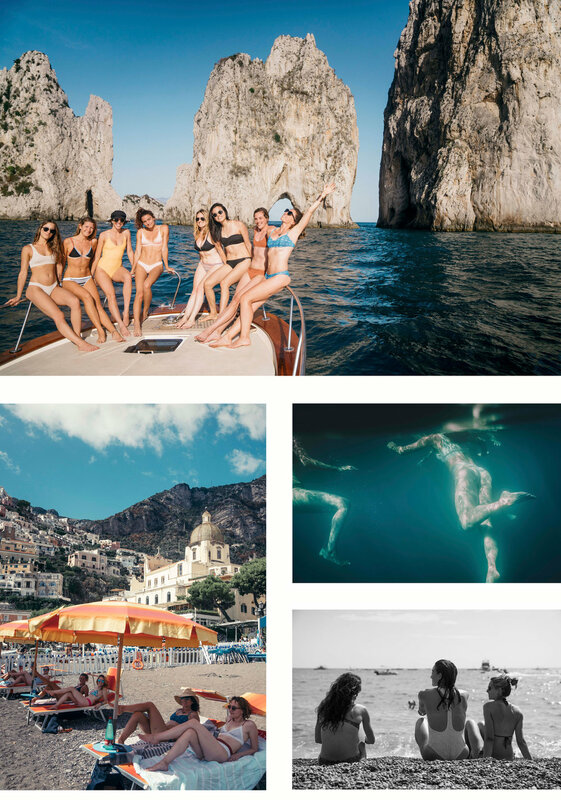 They were floating on the sparkling water reflecting the sun burning down on our skin waiting to take us to Capri. As we made our way we were surrounded by rocky arches and widened eyes, all hinting at one another to make the same move. As the sun beated down on us the water seemed more and more like the perfect escape. With no hesitation we all interlaced fingers and jumped into the magical water bellow. We splashed around, laughing, and taking in every precious moment as the sea wrapped around our bodies. The moment any body part left the water we could feel a new layer skin forming on our bodies, only this time it was made of salt. As we licked our chapped lips, all we could taste was the extra salty water unlike any ocean water we had experienced before. Our unforgiving feet walked endlessly around the town ready to wander and discover. The town was lined perfectly with brightly colored homes stacked one on top of the other until the whole mountain was decorated by its beauty. The busy streets greeted us with friendly smiles as we made our way to our most important destination; the gelato shop. Right when we thought it was impossible to be any more satisfied, our mouths filled with creamy gelato masking the salty taste of the sea creating complete perfection. 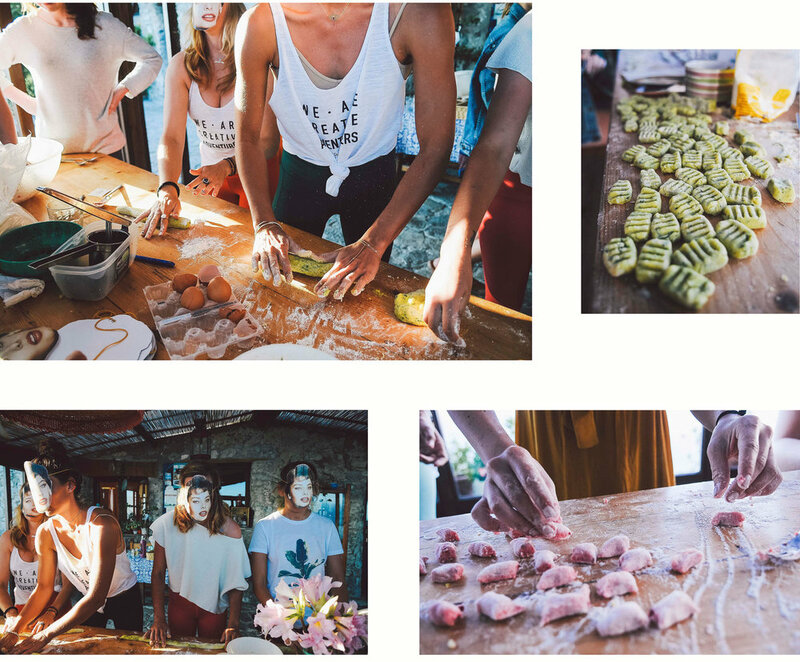 How could we leave this beautiful place; our new home with daily yoga, locally sourced delicious meals, and the salty unforgettable sea? We decided to leave our mark; to plant our roots into this beautiful place both figuratively and literally. Through the organization “Treedom” sixteen orange trees were planted deep into the dirt that grounded and celebrated our passion for six magical days. Their roots shared a home with what was once over run by the mafia spreading fear and danger, now converted into a safe agricultural treasure. These trees will forever feed the earth with the same tangy, loving energy that was gifted to us so freely. Gnocchi & Gnocche is about celebrating the un-obvious links between female beauty and the voluptuous sensuality of homemade gnocchi. As some of you may know, the word gnocche (plural for gnocca) in Italian slang means "beautiful, attractive woman". So if you are walking on the streets of Florence, Venice, or Rome, and someone addresses you with "Ciao, bella gnocca", you should know that they are appreciating your female beauty. To learn more about the connection between gnocche (beautiful women) and gnocchi (delicious pasta), join the workshop.